The WGCEP is a collaboration between SCEC, the USGS, and CGS aimed at developing official earthquake-rupture-forecast models for California. The project is closely coordinated with the USGS National Seismic Hazard Mapping Program, and has received financial support from the California Earthquake Authority (CEA). The WGCEP has now completed the time-independent UCERF3 model (UCERF3-TI, which relaxes segmentation and includes multi-fault ruptures) and the long-term, time-dependent model (UCERF3-TD, which includes elastic-rebound effects). We are now working on adding spatiotemporal clustering (UCERF3-ETAS) to account for the fact that triggered events can be large and damaging. As the latter will require robust interoperability with real-time seismicity information, UCERF3-ETAS will bring us into the realm of operational earthquake forecasting (OEF). We are also starting to plan for UCERF4, which we anticipate will utilize physics-based simulators to a greater degree (see last bullet below). Evaluate fault models in terms of the overall fault connectivity at depth (important for understanding the likelihood of multi-fault ruptures) and the extent to which faults represent a well-define surface versus a proxy for a braided deformation zone. Evaluate existing deformation models, or develop new ones, in terms of applicability of GPS constraints, categorical slip-rate assignments (based on “similar” faults), applicability of back-slip methods, and other assumptions. Of particular interest is the extent to which slip rates taper at the ends of faults and at fault connections. Evaluate the UCERF3 implication that 30% to 60% of off-fault deformation is aseismic. Help determine the average along-strike slip distribution of large earthquakes, especially where multiple faults are involved (e.g., is there reduced slip at fault connections?). Help determine the average down-dip slip distribution of large earthquakes (the ultimate source of existing discrepancies in magnitude-area relationships). Are surface slip measurements biased with respect to slips at depth? Develop a better understanding of the distribution of creeping processes and their influence on both rupture dimension and seismogenic slip rate. Contribute to the compilation and interpretation of mean recurrence-interval constraints from paleoseismic data and/or develop site-specific models for the probably of events going undetected at a paleosiesmic site. Develop ways to constrain the spatial distribution of maximum magnitude for background seismicity (for earthquakes occurring off of the explicitly modeled faults). Address the question of whether small volumes of space exhibit a Gutenberg Richter distribution of nucleations (even on faults). Develop improved estimates (including uncertainties) of the total long-term rates of observed earthquakes for different sized volumes of space. Refine our magnitude completeness estimates (as a function of time, space, and magnitude). Develop such models for real-time applications (as will be needed in operational earthquake forecasting). Develop methods for quantifying elastic-rebound based probabilities in un-segmented fault models. Help quantify the amount of slip in the last event, and/or average slip over multiple events, on any major faults in California (including variations along strike). Develop models for fault-to-fault rupture probabilities, especially given uncertainties in fault endpoints. Determine the extent to which seismicity rates vary over the course of historical and instrumental observations (the so-called Empirical Model of previous WGCEPs), and the extent to which this is explained by aftershock statistics. Determine the applicability of higher-resolution smoothed-seismicity maps for predicting the location of larger, more damaging events. Explore the UCERF3 “Grand Inversion” with respect to: possible plausibility filters, relaxing the UCERF2 constraints, not over-fitting data, alternative equation-set weights, applying a characteristic-slip model, and applicability of the Gutenberg Richter hypothesis on faults (see report at www.WGCEP.org). Develop applicable methods for adding spatiotemporal clustering to forecast model s(e.g., based on empirical models such as ETAS). Are sequence-specific parameters warranted? Determine if there is a physical difference between a multi-fault rupture and a separate event that was triggered quickly. Develop more objective ways of setting logic-tree branch weights, especially where there are either known or unknown correlations between branches. Develop easily computable hazard or loss metrics that can be used to evaluate and perhaps trim logic-tree branches. Develop techniques for down-sampling event sets to enable more efficient hazard and loss calculations. Develop novel ways of testing UCERF3, especially ones that can be integrated with CSEP. Study and test, using code verification exercises and more than one code, the sensitivity of simulator results to input details including fault-system geometry, stress-drop values, tapering of slip, methods of encouraging rupture jumps from fault to fault, cell size, etc. Develop physically realistic ways of simulating off-fault seismicity. Add additional physics into simulators, for example, the inclusion of high-speed frictional weakening and of off-fault viscoelastic and heterogeneous elastic properties. Develop alternate methods of driving fault slip besides “back-slip”. Make access to existing simulators easy for new users, including adequate documentation and version numbers, examples of input and output files for initial testing, and access to analysis tools. Publicize availability. Develop new approaches to designing simulators and/or of making them more computationally efficient, including the use of better algorithms, point source Greens functions, and GPUs. Develop validation tools for simulators, utilize existing UCERF data comparison tools with them, and develop capabilities for simulators to interact with UCERF infrastructure. Develop the capability of simulators to deal with UCERF and SCEC CFM fault geometries, both for rectangular and triangular cell representations. Create statewide synthetic earthquake catalogs spanning 100 My using as many different simulators as possible, in order to generate statistically significant behavior on even slow-slipping faults. Use small time-steps to permit evaluation of short-term clustering. Use these catalogs as synthetic laboratories for CSEP testing as described under CSEP. Data-mine these catalogs for statistically significant patterns of behavior. Evaluate whether much-shorter observed catalogs are statistically distinguishable from simulated catalogs. Consider and explore what revisions in simulators would make simulated catalogs indistinguishable from observed catalogs. Develop and test a variety of statistical methods for determining the predictability of the of earthquakes in these simulated catalogs. Compute other data types such as gravity changes, surface deformation, InSAR images, in order to allow additional comparisons between simulated results and observations. Further suggestions and details can be found at http://www.WGCEP.org, or by contacting the project leader (Ned Field: field@usgs.gov; (626) 644-6435). The Working Group on California Earthquake Probabilities (WGCEP) is charged with developing official, consensus, and time-dependent earthquake forecast models for California. The effort builds on a long tradition of previous WGCEPs (e.g., models published in 1988, 1990, 1995, 2003, and 2008), and involves explicit collaboration between SCEC, the USGS, and CGS, with considerable funding from the California Earthquake Authority (http://www.earthquakeauthority.com). 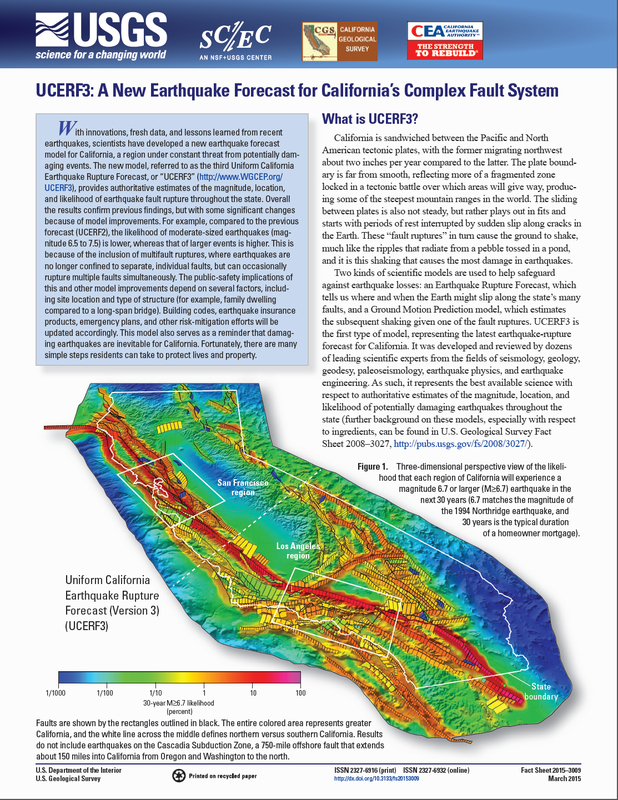 The previous WGCEP model was the Uniform California Earthquake Rupture Forecast version 2 (UCERF2, http://www.scec.org/ucerf2/), which was published in 2008. Since that time we have been working on the next model, UCERF3, for which the main goals have been to: 1) relax segmentation and include multi-fault ruptures; 2) develop an algorithm for computing more self-consistent long-term elastic-rebound-based probabilities; and 3) include spatiotemporal clustering effects in acknowledgement that aftershocks and triggered events can be large and damaging. The latter (spatiotemporal clustering) will bring us into the realm of Operational Earthquake Forecasting (OEF). The need for these enhancements has been exemplified by several recent earthquakes, including the 2011 M9 Tohoku earthquake with respect to segmentation, both the 2010 M7.2 El Mayor-Cucapah and 2012 M8.6 Sumatra earthquakes in regard to multi-fault ruptures, and the 2011 M6.3 Christchurch earthquake in terms of spatiotemporal clustering. Progress on each of these goals is given below. The backbone of UCERF3 is the long-term, time-independent model (UCERF3-TI), which was published as a USGS Open-File Report on Nov. 5, 2013, and includes a main report, 20 appendices, and various supplements (http://pubs.usgs.gov/of/2013/1165/). The main report and one of the appendices have also been published in a peer-reviewed journal (as Field et al. (2014) and Page et al. (2014), respectively). The primary achievement for this model component was relaxing fault segmentation and including multi-fault ruptures, both limitations of UCERF2. The rates of all earthquakes were solved for simultaneously, and from a broader range of data, using a system-level “grand inversion” that is both conceptually simple and extensible. The inverse problem is large and underdetermined, so a range of models was sampled using an efficient simulated annealing algorithm. The approach is more derivative than prescriptive (e.g., magnitude-frequency distributions are no longer assumed), so new analysis tools were developed for exploring solutions. Epistemic uncertainties were also accounted for using 1440 alternative logic tree branches, necessitating access to supercomputers. The most influential uncertainties include alternative deformation models (fault slip rates), a new smoothed seismicity algorithm, alternative values for the total rate of M≥5 events, and different scaling relationships, virtually all of which are new. As a notable first, three deformation models are based on kinematically consistent inversions of geodetic and geologic data, also providing slip-rate constraints on faults previously excluded due to lack of geologic data. The grand inversion constitutes a system-level framework for testing hypotheses and balancing the influence of different experts. For example, we have demonstrated serious challenges with the Gutenberg-Richter hypothesis for individual faults. UCERF3-TI is still an approximation of the system, however, and the range of models is limited (e.g., constrained to stay close to UCERF2). Nevertheless, UCERF3-TI removes the apparent UCERF2 over-prediction of M6.5-7 earthquake rates and also includes types of multi-fault ruptures seen in nature. Although UCERF3-TI fits the data better than UCERF2 overall, there may be areas that warrant further site-specific investigation. Finally, the supporting products may be of general interest, and we listed key assumptions and avenues for future model improvements in the report. This model, which builds on UCERF-TI, includes long-term, time-dependent probabilities based on Reid’s elastic-rebound hypothesis, which posits that rupture likelihood drops on a fault after experiencing a large rupture and then builds back up as tectonic stresses re-accumulate with time. A new methodology was developed (Field, 2015) that solves applicability issues in the previous approach for un-segmented models. The new methodology also supports magnitude-dependent aperiodicity and accounts for the historic open interval on faults that lack a date-of-last-event constraint (Field and Jordan, 2015). Epistemic uncertainties are represented with a logic tree, producing 5,760 different forecasts. Results for a variety of evaluation metrics have been presented, including logic-tree sensitivity analyses and comparisons to the previous model (UCERF2). For 30-year M≥6.7 probabilities, the most significant changes from UCERF2 are a threefold increase on the Calaveras fault and a threefold decrease on the San Jacinto fault. Such changes are due mostly to differences in the time-independent models (e.g., fault slip rates), with relaxation of segmentation and inclusion of multi-fault ruptures being particularly influential. In fact, some UCERF2 segments were simply too long to produce M 6.7 sized events. Probability model differences are also influential, with the implied gains (relative to a Poisson model) being generally higher in UCERF3. Accounting for the historic open interval is one reason. Another is an effective 27% increase in the total elastic-rebound-model weight. The exact factors influencing differences between UCERF2 and UCERF3, as well as the relative importance of logic-tree branches, vary throughout the region, and they depend on the hazard metric of interest (e.g., M≥6.7 probability changes may not translate to hazard). This sensitivity, coupled with the approximate nature of the model, as well as known limitations, means the applicability of UCERF3 should be evaluated on a case-by-case basis. Overall, UCERF3 represents the best model currently available for forecasting California earthquakes. UCERF3-TD was been reviewed by our Scientific Review Panel, including the aforementioned supporting papers, and the main report was published in the Bulletin of the Seismological Society of America (Field et al, 2015). A USGS fact sheet was also published (http://pubs.usgs.gov/fs/2015/3009/), and we had a press release on the day the model went public (http://www.usgs.gov/newsroom/article.asp?ID=4146). With the time-independent and time-dependent models published (described above), we have now turned our attention to including spatiotemporal clustering. In recognition that triggered events can be large and damaging, the ultimate goal is to deploy an Operational Earthquake Forecast (OEF) for California, now listed as one of the USGS‘s strategic-action priorities (http://pubs.usgs.gov/of/2012/1088; page 32). In short, OEF aims to provide real-time forecasts to help communities prepare for earthquakes. To this end, we have added an Epidemic Type Aftershock Sequence (ETAS) component to UCERF3 (UCERF3-ETAS). Most notably, our model represents a merging of ETAS with finite-fault based forecasts, as well as the inclusion of elastic rebound (both firsts, as far as we are aware). In fact, inclusion of elastic-rebound turns out to be critical in terms of getting spatiotemporal clustering statistic correct (otherwise ~85% of large triggered events simply re-rupture the same fault, which we don’t see in nature). UCERF3-ETAS is currently being “test-driven”. Our intent is to continue documenting the model and subjecting it to more rigorous testing (e.g., via CSEP) over the next year. Toward operationalization, the USGS and SCEC are co-funding a series of OEF-related workshops at the USGS Powell Center in Fort Collins, CO (https://powellcenter.usgs.gov). The first workshop, held in March 2015, addressed the "Potential Uses of OEF", for which a report has been written and submitted to Seismological Research Letters (Field et al., 2016). Forthcoming workshop topics include "Best Available Science for OEF", "Operationalization Challenges for OEF", and "Verification and Validation of OEF", where the latter includes testing effectiveness of product messaging. Field, E.H., and 2014 Working Group on California Earthquake Probabilities, 2015, UCERF3: A new earthquake forecast for California’s complex fault system: U.S. Geological Survey Fact Sheet 2015–3009, 6 p., http://dx.doi.org/10.3133/fs20153009.